Those shorts, that tee, I'm sorry they just never get old for me. Because I don't have a tripod and this house appears to be completely lacking in anywhere to get full length shots, you almost never get to see my shoes. This is actually quite a shame, as I do have a bit of a thing for shoes. My collection is huge, and I can walk away from a pair, but the shoes I buy I love and I'm a firm believer in shoes making the outfit in many a case. These H&M flats are my current favourites. They're that shade of pink that is just so damn versatile and they're comfy and I should probably given them a rest. Now then, on to a bit of a review. Beauty blogger, expert or connoisseur I am not but sometimes I just can't resist sharing something I've found. 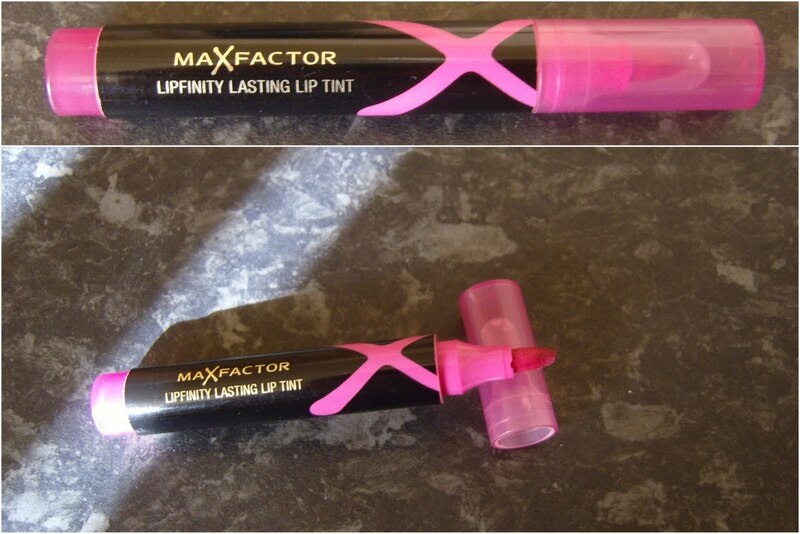 In this case it's the MaxFactor Lipfinity Lip Tint. ﻿Now I'm a bit of a jessy when it comes to lip colour. I don't like anything too strong or too in your face. I find myself thinking I look a bit like a clown. My mum suggested lip tint and when I saw this advertised earlier in the year it sounded perfect- tint, in an easy to use pen, variety of colours, high street brand that is likely to be reasonably priced. I paid around £7 for mine from Superdrug and I think it was on offer. I reckon it's a pretty fair price for a high street brand with a reasonable reputation. There are 5 shades and this one is pretty much in the middle. I like the look of a slightly more brown toned natural colour too, which I thought might be a bit pale, but having tried this one I'd definitely try. So what do I think? Well the pen style is definitely easy to use. I line the outside of my lips with the very ends and the fill in the rest with the side of the nib. The colour isn't instantly intense and takes 2-3 layers to build full intensity but I like this it means I can keep it more subtle if I want or need to. Me, wearing shade 3, 2 coats. 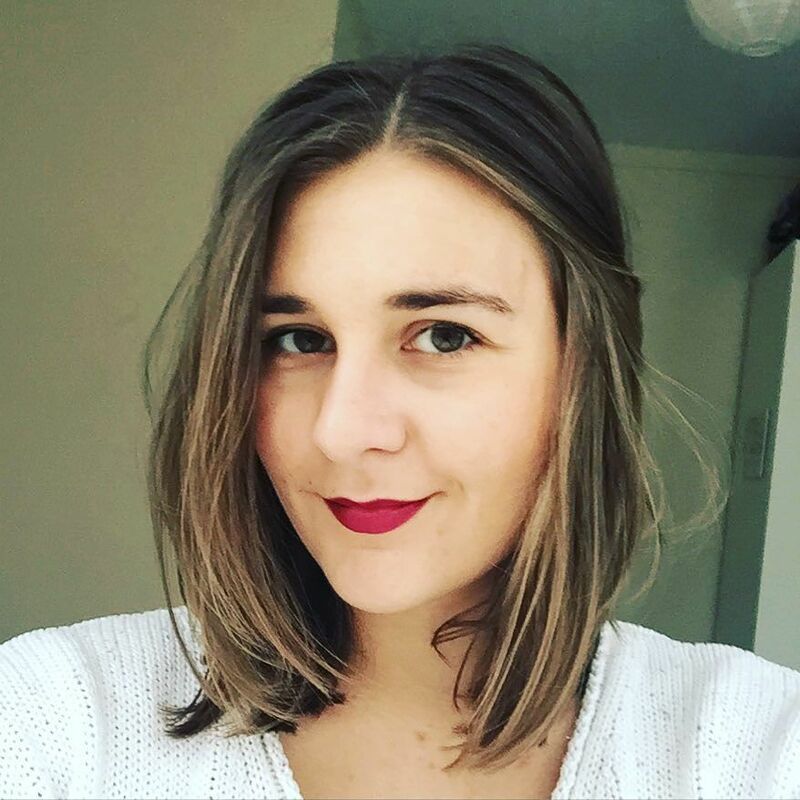 If you're a bit scared of full on lipstick and not a fan of gloss, this could be the solution for you. However I do have 2 criticisms. First up, the tint is quite drying. I tend to add lip salve over the top of it- although do give the tint a few minutes to sink in properly first. The second is the staying power. I thought that a tint might last better than this, but traces of it have usually disappeared within 3 hours. I didn't think this was so great, but those of you with a bit more knowledge of cosmetics please feel free to let me know if that's reasonable. All in all, I like this product. It certainly works for my needs and is easily shoved into the small make up back I have in my handbag and would easily fit into my small clutches that I use for events and going out. And despite the 2 drawbacks, for £7 I would buy it again. Has anybody else tried these tints? What did you think to the other shades? Do you have any tips for extending the wear and would you buy it again? And lastly, anybody have any other lip tint recommendations? Nice outfit, 'That t-shirt' is fab. I'm also quite envious of your tan..
And also v jealous of your tan! I am having to avoid red lips at the mo and they are clashing with my red (burnt :() nose!! 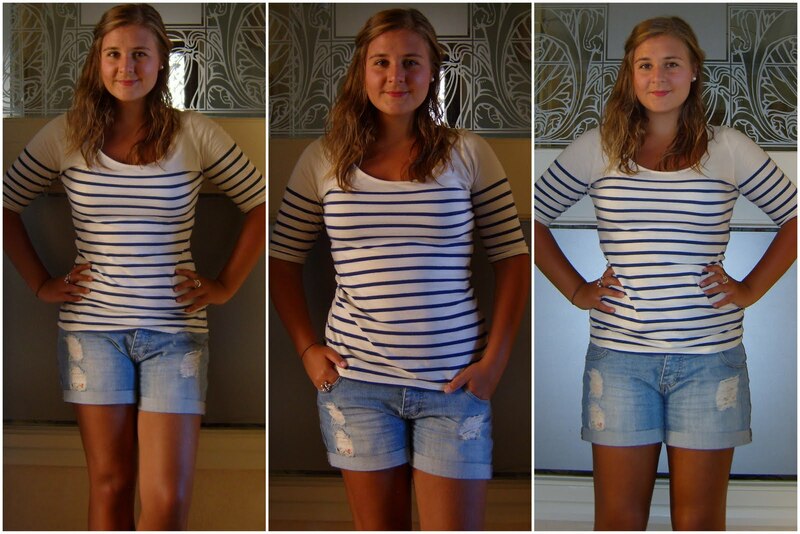 striped top & ballerinas are the perfect wardrobe staples in my opinion. so cute, i love the stripes! That lip tint is so lovely on you and you are so, so pretty!